Happy 11/11 fellow Lightworkers. 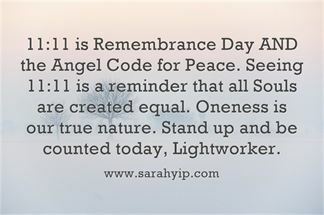 Not only is it Remembrance Day, the Master Number 11 is doubly-activated (aka the Spiritual Messenger in numerology), plus we have a new Moon in Scorpio (powerful endings and rebirth). If you’ve been wanting to launch something in the psychic, metaphysical, spiritual and healing fields, now is your chance! Humanity is opening to the possibility that multiple dimensions exist (11:11 looks like mirrors or parallel Universes) and there are more and more opportunities for those carrying pure intentions. As a thank you for your support, here is my latest summary of why you might be seeing 11:11. I presented it last weekend at the Conscious Life Festival to a group of amazing Souls (thank you Laura di Mambro, my beautiful Master 33 Lifepath friend). Many adults and children came up to me afterwards to tell me about their 11:11 and number spottings! What a privilege. 1) You’re part of a wave of Lightworkers who have come to Earth to help people evolve. 3) You’re here to assist the people mentioned in 2) as a mentor, healer, parent. 4) You’re at a Spiritual Turning Point – often a 1 or 9 Personal Year, or another Peak. Find your Personal Year. 5) You’re going crazy/ It’s a coincidence! (That’s the scientist in me coming out. Just kidding. You’re actually going sane. I have hundreds of photos that prove 11:11 is more than just confirmation bias, see my facebook page The Numbers Queen). 6) Your Third Eye Chakra (Mind) & Heart are opening to our multi-dimensional reality. You’re going through a DNA upgrade and activation (thanks to my fellow 29/11 lifepath Alexis Cartwright from Transference Healing for this insight). 7) It’s time to study Ascension, Starseeds, Chakra Healing etc. and leave behind scepticism, fear and insecurity. Repeating Numbers can be linked to particular chakras or messages, see this article. 8) You are connecting with a Soulmate or Twin Flame and experiencing an opportunity for past-life or parallel-life healing. 9) Your Spirit Guides/ Soul/ loved ones are calling you. Please meditate! There’s ‘mail’ in your inbox. 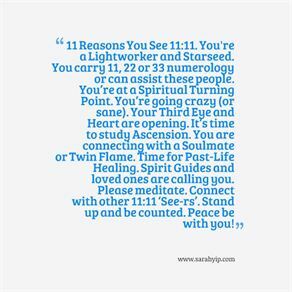 10) It’s time to connect with other ‘See-rs’ who have 11:11 stories. Strength in numbers. We Are One, but We Are Many. It’s Time to Lead the Leaders and Teach the Teachers. Stand Up and Be Counted. Strength in Numbers. Every Soul is Equal. Align Yourself with Source. All is Oneness. Oneness is All. You are Love. Peace be with you (when you make the peace sign with two hands, it looks like 11:11 – no wonder Remembrance Day is celebrated on the 11th November at 11am). The first, or Root Chakra is about belonging and 11:11 is sign that you are always loved and supported. Wherever you go, Spirit is right there with you. Leap, and the net will appear. What should I do when I see 11:11? It’s up to you – you’re experiencing a moment in time when the veil between reality and Spirit is at its thinnest. I like to make a wish for the world and one for myself when I see 11:11. I also stop and tune into my body (11 looks like a pause symbol). Taking a deep breath and asking Spirit ‘what would you have me know?’is another suggestion. Happy exploring and may the Light bring you Peace. Thank you for your support. If you like this blog, please join my facebook page The Numbers Queen. You’re welcome to post on the timeline. I publish many 11:11 and numerology tips weekly.